Here's a cute gift idea for the guy who spends a lot of time manning the computer for work or play. The computer male brown hair personalized Christmas ornament is made entirely by hand including the personal greeting that you provide us with. These work and hobby ornaments personalized to become lasting mementos arrive in our velvet drawstring gift bag that's ideal for storage too. 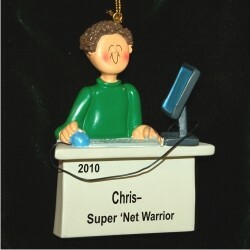 Brighten his day on any occasion with the brunette male computer master personalized Christmas ornament from Russell Rhodes. Memories Dec 22, 2015 Kelly M.